Bulgaria is N 1 in the world in the production of lavender oil. In 2011 Bulgaria produced between 45-50 tons of lavender oil. The former leader in the production of lavender oil - France produces only 25-30 tons a year. 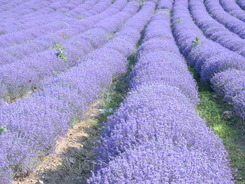 The two countries produce 75% of the world production of lavender oil, France press informed. Some 80-90% of the lavender oil production in Bulgaria is exported for France. The biggest number of lavender fields in Bulgaria are in the region of the town of Kazanluk. A kilogram of lavender oil sells at 90-100 euro.